The Celebrity Millennium Wine Cruise left plenty of time to explore California Wine Country while the ship remained docked in San Francisco. 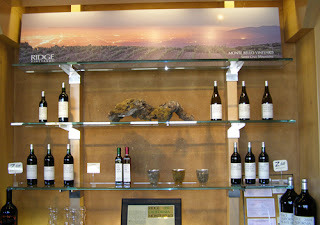 Since I had been to Napa recently, I chose to do one stop there and then spend most of the time in Sonoma. Wine Road Northern Sonoma County arranged for our transportation from the ship and we headed to Napa Valley for our appointment at Mumm, a premiere maker of sparkling wines. The weather was warm and sunny and the views of the vineyard were just beautiful. Winemaker Ludovic Dervin took us around the property and through the self-guided tour of the winery, which was built in 1987. 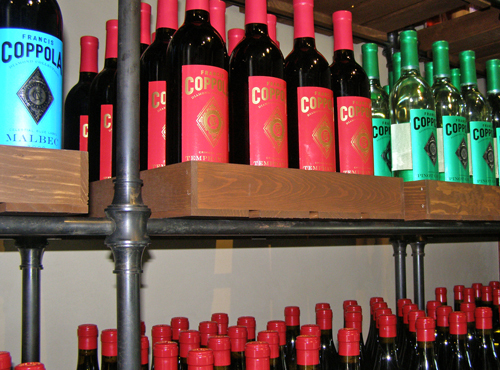 The tour is as entertaining as it is informative (I loved “Bob,” the robot who safely puts the bottles in the boxes). In addition, Mumm maintains photo and art galleries and I was excited to see some incredible work by famed photographer Ansel Adams , as well as a preview of a brand new exhibition by Robert Buelteman . 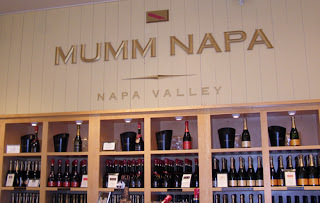 Dervin, who has been with Mumm since 2002, also told me that while they follow méthode champenoise for their sparklings, they incorporate pinot gris in with the standard chardonnay, pinot mineur and pinot noir grapes. 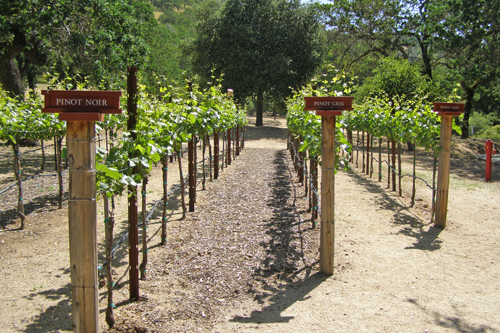 They are also always the first winery in Napa to pick their grapes, when they are firm and juicy. I certainly couldn’t argue with the method after sampling their wines on the deck. My favorites were the 2006 Blanc de Blanc, a fruity blend that benefits from just 10% pinot gris added to the chardonnay, and the Cuvee M, a peachy blend that combines pinot gris, muscat and viognier. I also enjoyed the Brut Prestige, a non-vintage sparkling that is well-balanced, a blend of pinot noir (80%) and chardonnay (20%). 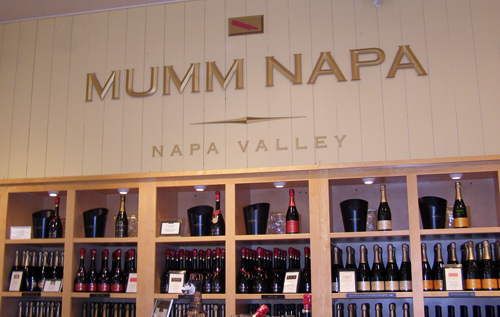 After Mumm we were off to Sonoma and the Francis Ford Coppola Winery. I had been there in August when they had just opened and the place was still under construction, with a pool to come. It’s finished now and quite impressive, though this winery was pretty impressive without it. 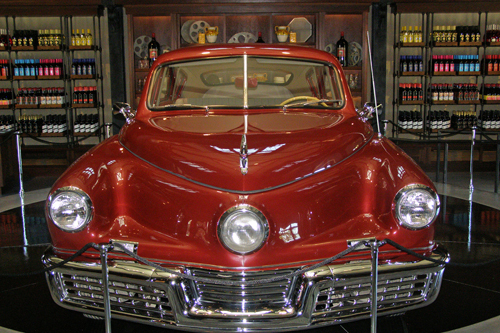 Where else can you taste some of the best wines in California while looking at the car featured in Tucker or the desk the Godfather sat in? There’s no shortage of Hollywood paraphernalia here from one of the greatest directors of all time -- and he has the Oscars… and Golden Globes… and Directors Guild Awards showcased to prove it. 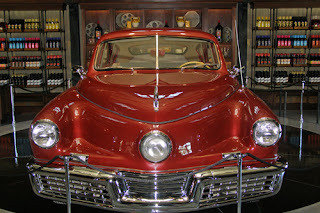 But this winery isn’t just about the movies, it’s about wine and food, and I got to taste both. 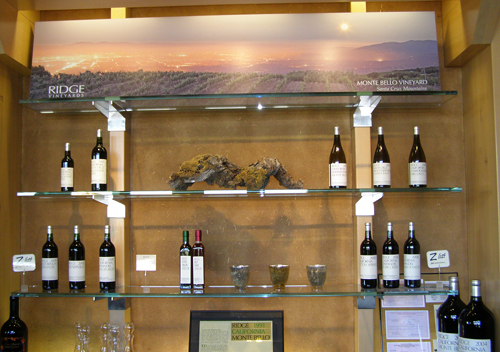 We checked out the memorabilia before making our way to the tasting bar. The 2009 Diamond Collection Sauvignon Blanc was made for me, a light, tropical blend with a bit of mineral and a lot of grapefruit. I was also thrilled with the 2009 Francis Ford Coppola Presents Chardonnay, unoaked and fruity, just as I believe the grape should be. The 2008 Francis Ford Coppola Reserve Viognier was yet another light and white offering, this one with pear and apple notes. While I was surrounded with my favorites, Lynn helped me check out some of hers, settling in with the complex and fulfilling 2008 Francis Ford Coppola Dutton Ranch Pinot Noir and the 2008 Director’s Cut Alexander Valley Cabernet Sauvignon, a very smooth cabernet sauvignon with a bit of petite verdot. 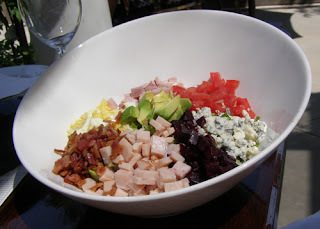 Lunch was at Rustic, Francis Ford Coppola’s restaurant on the premises with the knowledgeable (and fun!) Tracy Logan from Wine Road Sonoma. 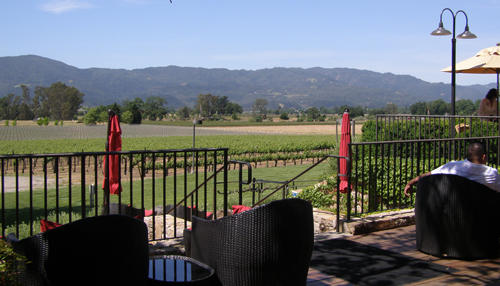 This is not a little café that you might find at your average winery. This is a full service, high quality restaurant that you must – and should – make reservations for in advance. Lynn and I shared two pasta dishes: Bumbola A Con Broccoli E Salsiccia (broccoli rabe, Italian sausage, red wine, fontina cheese and cream) and Rigatoni & Meatballs. Both dishes were cooked to perfection, though I was a bit jealous when I saw the Tracy’s Cobb Salad, full of large chunks of turkey, bacon, cheese and tomatoes. 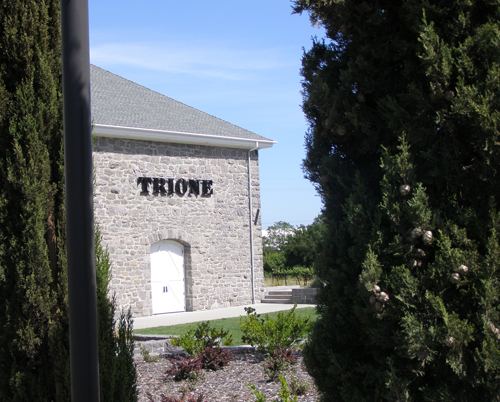 After some perfect cappuccino to finish off the meal, we were off Trione Winery, 8,000 family-owned and run acres. They actually sell most of their grapes to other wineries, but they also keep some for themselves: the 2008 Russian River Sauvignon Blanc was an oaked version that still retained some fruit; the 2007 Alexander Valley Primitivo is from a young primitivo vineyard mixed withzinfandel, spicy on the back, but fruit forward; and the 2006 Block 21 Cabernet Sauvignon, with some merlot, petite verdot and malbec, was very good. I also got to taste some of the 2010 Late Harvest Sauvignon Blanc from the tank and I will be anxiously waiting for that bottle to be released. We toured the grounds of Trione, which have room for outdoor events and tastings and a great inside banquet area, before heading over to Ridge Vineyard. The selection here is typical for the California Wine Country region – cabernet, zinfandel and chardonnay – with the exception of 2007 Lytton Spings, 71% zinfandel, 22% petite syrah and 7% carignane, a yummy merlot-like red that’s not overly oaked. My other pick here is the 2009 Paso Robles Zinfandel, which follows up on its red fruit nose with a fruity, semi-sweet taste. 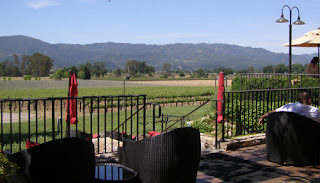 I really liked downtown Healdsburg the last time I was in Sonoma so I was glad we would be staying there overnight. 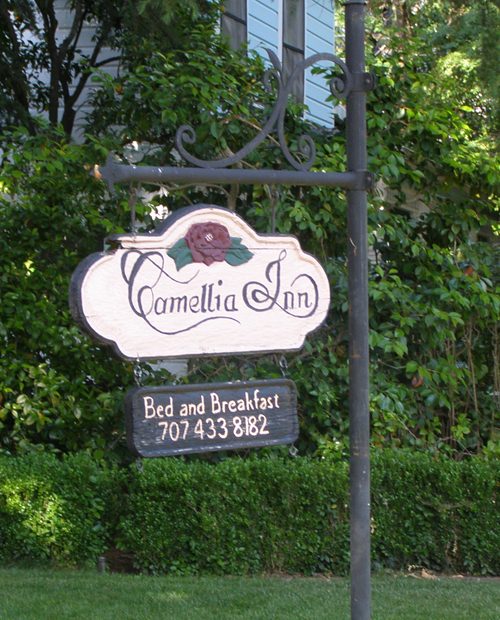 We had an apartment through Camellia Inn (which also has an adorable Bed& Breakfast). It was only a short walk from there past the wine bars and tasting rooms the town is known for to Scopa Restaurant. It was a tiny, bustling place where you could barely hear yourself think, but I was told the food was well worth it and that was certainly true. I kept it local, sipping an Iron Horse Blanc de Blanc as I nibbled on homemade ciabatta bread dipped in Dry Creek Extra Virgin Olive Oil and equally delicious Chanterelle Mushroom Risotto Balls Stuffed with Fontina. For our main courses we did our best to consume as much as we could of a flavorful Pappardelle with Duck Ragu and lemony-light Artichoke Ravioli with Ricotta , Milk and Chili. It was easy to see (or taste) why this place was so packed. It was soon back to the apartment for a good night’s sleep before we finished our time in Sonoma and headed back to the ship.